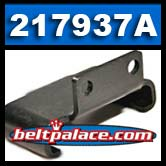 Comet 217937A Brake Caliper Mounting Bracket for Comet 218070A Brake Assembly. Genuine Comet Industries part made in USA! OEM/REPLACES: Murray 680244, Comet 217937C.